Designers and engineers involved in building system technology can rely on WSCAD Electrical Installation to design high and low voltage installations, as well as antenna and fire alarm systems. WSCAD Electrical Installation is easy to handle and is fully integrated with other disciplines such as electrical engineering or cabinet engineering. You can design power distributions in buildings and define the location of operating material in machines, plants and buildings. Existing floor plans in PDF or DWG format are imported to scale. All field devices from the plant layout and control diagrams (from Building Automation design) are placed in the floor plans and linked to the existing symbol data of the diagrams. Cable labels are taken over, cable and material lists are generated, and the software automatically calculates all required material quantities. This makes your project work much easier and eliminates time-consuming calculations for quotations. WSCAD Electrical Installation is ideal for engineers, electrical installers, craftsmen companies, facility managers, electrical system contractors and cabinet builders, as well as maintenance and service personnel specialised in electrical and building technology. Securely save employee knowledge in WSCAD project templates including the right parts data. Once an employee leaves their know-how is still available within the company. Easy-to-Use: amongst other prices WSCAD software has been awarded with the „Golden e“for its easy to use user interface. Access over 1.2 million parts data and symbols from more than 200 manufacturers in wscaduniverse.com and save yourself the hassle of designing the parts. 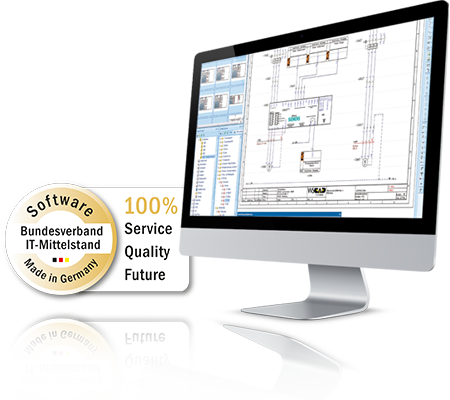 Use one single software to handle different aspects of a building of plant: network plan, circuit diagram, hydraulic/pneumatics, piping and instrumentation diagram, cabinet engineering, etc. Reduce manual work by automating engineering processes and store your know-how in standard project templates. Reusing these saves enourmous amonunts of time and substantially improves the quality of your output. Gather data only once and then access it seamlessly across all engineering disciplines: from the data point of a sensor to the terminal in the cabinet. Make use of the WSCAD integration to PLM and ERP systems to integrate all engineering data in one backbone. It reduces errors and rework. With WSCAD you can create installation und distribution plans for 140 residential units in 1.5 days, including all documentation. Just ask us for real life examples. Define standards and increase reuse of standard modules to save enourmous amounts of time while achieving higher quality at the same time. Rely on the integrated dictionary to create multi lingual schematics. The complexity of buildings and systems is increasing – WSCAD software is helping you manage that. Manage schematics and engineering data across various engineering disciplines with network plans, reception and data technology as well as communications and security technology. The right data, at the right place, at the right time: maintenance engineers and service personnel can use their mobile to scan parts with the WSCAD Augmented Reality App. In the blink of an eye they will get the corresponding circuit diagram, device designation, complete parts data including 3D and the original data sheet from the manufacturer.